Come and experience Montmartre and its cathedral, architecture and museums. Travelers appreciate the cafés in this cosmopolitan city. Galeries Lafayette and Arc de Triomphe are just a couple of the must-sees in the area. Whether you're planning a family vacation, friends trip or romantic retreat, HomeAway has a great selection of vacation homes. Many rentals come with a full kitchen and separate dining area, perfect if you need a space for entertaining. The nearest airport is in Paris (ORY-Orly), located 11 mi (17.7 km) from the city center. If you can't find a flight that's convenient for your trip, you might consider flying into Paris (CDG-Roissy-Charles de Gaulle), which is 13.3 mi (21.4 km) away. Catch a ride on the metro at Abbesses Station to easily navigate the city. Where to stay around Montmartre? Our 2019 accommodation listings offer a large selection of 423 holiday lettings near Montmartre. From 383 Condos/Apartments to 404 Studios, find unique self catering accommodation for you to enjoy a memorable holiday or a weekend with your family and friends. The best place to stay near Montmartre is on HomeAway. What is the best area to stay when travelling to Montmartre? What are the most popular points of interest and landmarks to stay near when travelling to Montmartre? 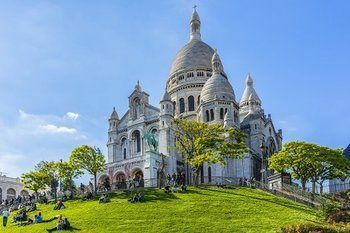 But there are many other points of interest around Montmartre listed on HomeAway where you can find your place to stay. Please use our search bar to access the selection of holiday rentals available near the point of interest of your choice. Can I rent Condos/Apartments in Montmartre? Can I find a holiday accommodation with pool in Montmartre? Yes, you can select your preferred holiday accommodation with pool among our 3 holiday homes with pool available in Montmartre. Please use our search bar to access the selection of holiday rentals available.